Iker poses with family and friends before trick-or-treating. Trick-or-treating and dressing up as a favorite character on Halloween is a rite of passage all kids deserve to experience. 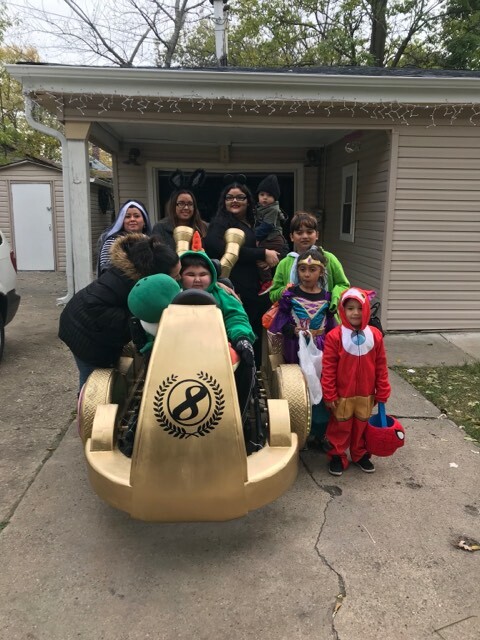 The crew at Magic Wheelchair is working to make sure that kids who use wheelchairs also get to a chance to enjoy the magic and mystery of All Hallows’ Eve while wearing an out-of-this-world costume. As soon as Anayelli Garcia found Magic Wheelchair, a nonprofit organization whose vision is to “put a smile on the face of every child in a wheelchair by transforming their wheelchairs into awesomeness,” she contacted the organization to make a costume for her son, Iker, who lives with Duchenne muscular dystrophy (DMD). Magic Wheelchair’s founder, Ryan Wiemer, is a father of three children with spinal muscular atrophy (SMA). His daughter passed away when she was just 3 years old. Iker was diagnosed with DMD eight years ago at the age of 5. “I first noticed there was something wrong when he was struggling to walk. He fell a lot and had a different gait compared to other kids. We took him in to get tests done and within a week we learned his diagnosis,” shares Anayelli. She’s been waiting a year for her Halloween wish for Iker to come true. “I saw a video last year of other kids on Facebook getting these ‘magic wheelchairs,’ and I wanted Iker to get one, too,” Anayelli says. Magic Wheelchair commissioned a group of students from DePaul University in Chicago to create Iker’s costume. “Iker’s muscle disease is progressing quickly, so he’s not able to do a lot of things like he used to, but he still enjoys drawing and he loves playing video games like Wii and Nintendo. He plays Mario Kart and he really loves Yoshi. That’s his favorite character,” Anayelli says. The team making Iker’s costume has spent the last two months recreating a golden cart from Mario Kart 8. 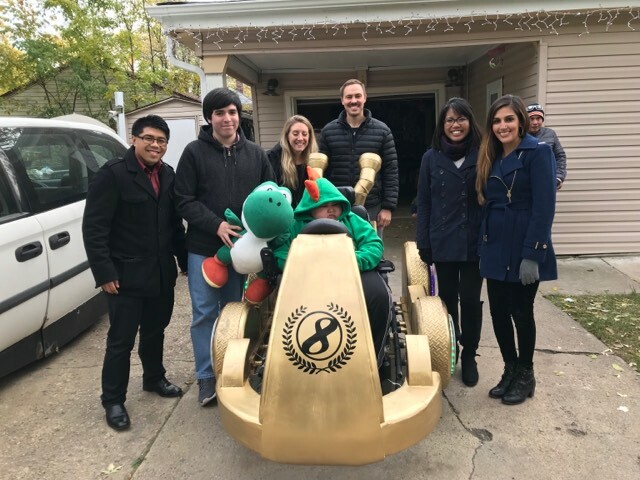 The costume was constructed to go over Iker’s wheelchair, quite literally putting him in the driver’s seat, just like Yoshi’s character in the game. Iker and the students from Depaul who helped make his Magic Wheelchair dream a reality. Iker met with the team several times as they took measurements, made adjustments and held a crash course in Halloween-costume-making 101 (unfortunately, not an actual course offered at DePaul). Iker had specific requests to keep his costume authentic to that of Yoshi in Mario Kart 8, and the team was more than happy to oblige, adding a Yoshi-inspired outfit for Iker to wear while behind the wheel of his golden car. His getup is complete with a green sweatshirt with orange spikes and a white stomach with a shell on the back to keep him warm, comfortable and in character. This project is all about Iker, but his little brothers are also Mario Kart fans and couldn’t wait to see the finished project. “Iker was nervous to get his costume but he was so excited with the final outcome,” Anayelli says. Help kids and adults like Iker continue to live longer and grow stronger.